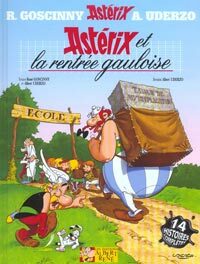 Asterix and his friends travel through history providing fascinating reading along the way. ISBN: 9782012101449 ISBN10: 2012101445. Written by: R Goscinny. Text by Goscinny, Illustrations by Uderzo, hardcover. ISBN: 9782012101562 ISBN10: 2012101569. Written by: R Goscinny. Text by Goscinny, Illustrations by Uderzo, hardcover. ISBN: 9782012101401 ISBN10: 2012101402. Written by: R Goscinny. Text by Goscinny, Illustrations by Uderzo, hardcover. ISBN: 9782012101487 ISBN10: 2012101488. Written by: R Goscinny. Text by Goscinny, Illustrations by Uderzo, hardcover. ISBN: 9782864970200 ISBN10: 2864970201. Written by: R Goscinny. Text by Goscinny,Illustrations by Uderzo, hardcover. ISBN: 9782012101524 ISBN10: 2012101526. Written by: R Goscinny. Text by Goscinny, Illustrations by Uderzo, hardcover. ISBN: 9782012101463 ISBN10: 2012101461. Written by: R Goscinny. Text by Goscinny, Illustrations by Uderzo, hardcover. ISBN: 9782012101388 ISBN10: 2012101380. Written by: R Goscinny. Text by Goscinny, Illustrations by Uderzo, hardcover. ISBN: 9782864971535 ISBN10: 2864971534. Written by: R Goscinny. Text by Goscinny, Illustrations by Uderzo, hardcover, 48pp..
ISBN: 9782864970156 ISBN10: 2864970155. Written by: R Goscinny. Text by Goscinny,Illustrations by Uderzo, hardcover.